Last week was our county fair. It's three days of 4-H bucket calves, dirt and sweat and stinky, carnival rides, funnel cakes, mutton busting, monster trucks and tractor pulls, visiting with neighbors and friends, 100 bottles of water, 100 times saying, "Please don't stare at the toothless, tattooed and randomly pierced carnival workers, it's not nice." They stared anyway. No matter how much work it all is or how hot the temps get, Steve and I love seeing the boys give their best efforts in showing their calves - all the while grinning from ear to ear as they run around with friends and cousins, taking it all in, filled with delight....and corn dogs and lemonade and funnel cakes. 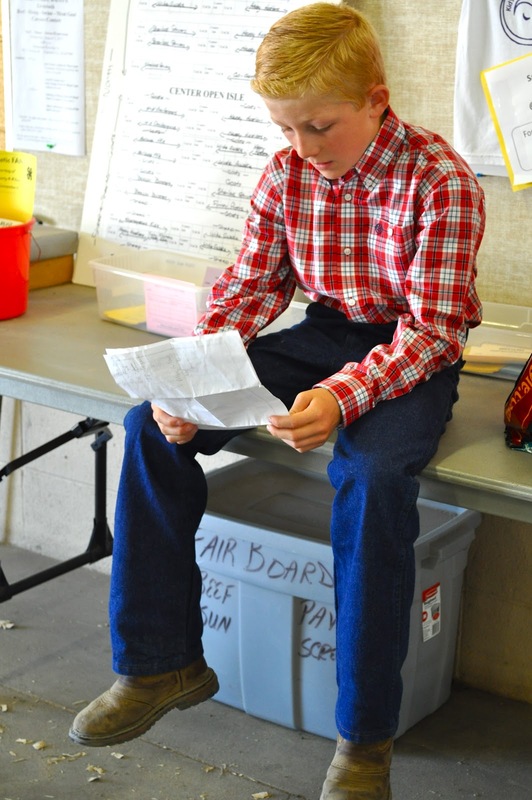 Before they show their calves in the arena, they boys each go through a judges interview. They have a set of questions to study that helps them prepare, then they are on their own, one-on-one with the judge, no parents allowed! 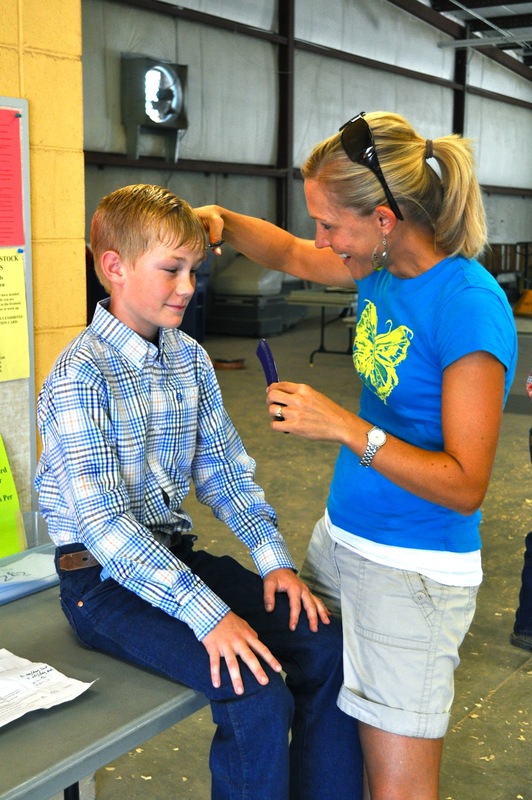 Getting spiffed up is all a part of the experience! The week before the fair we go to the Crazy House, a local western store, and the boys all pick out new shirts and jeans to wear. Surprisingly, as much as they hate to shop or could care less about what they wear, they love this! With Charlie being sick the days before the fair, I didn't have time to take the boys in for hair cuts, so they sat patiently while I gave 'em a little trim and reviewed the questions. While I prepped Ben and Andrew for their interviews, George got a little help trimming up his calf, Blaze, for the show. I was a little bit worried about what Henry would do all day while Steve and I concentrated on helping the older 3, but worry was pointless. Henry had a great time chatting with fellow 4-Hers, sitting in random people's lawn chairs and drinking Gatorade all day. He's such a great sport! After they're trimmed up, the calves get a nice cool soapy bath. Then, they're taken out into the sun to dry. 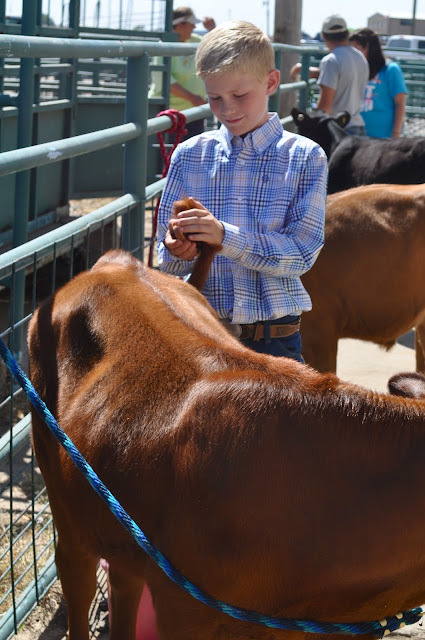 The boys take a lot of time and care brushing the calves, all the way down to the tail. It's like spa day for the little steers. I have to admit I was a little jealous! They even get special spray on their coat that makes it nice and shiny. Of all three calves, Blaze was definitely the most stubborn and squirrely. That made Blake and George a perfect pair! Here they are, all ready to enter the arena! The judge takes some time to talk to each of the kids about their steer. This is a great learning experience for the boys! The three cousins, Ben, Andrew and Ethan take a final lap around the arena before the judge announces the ribbon standings. 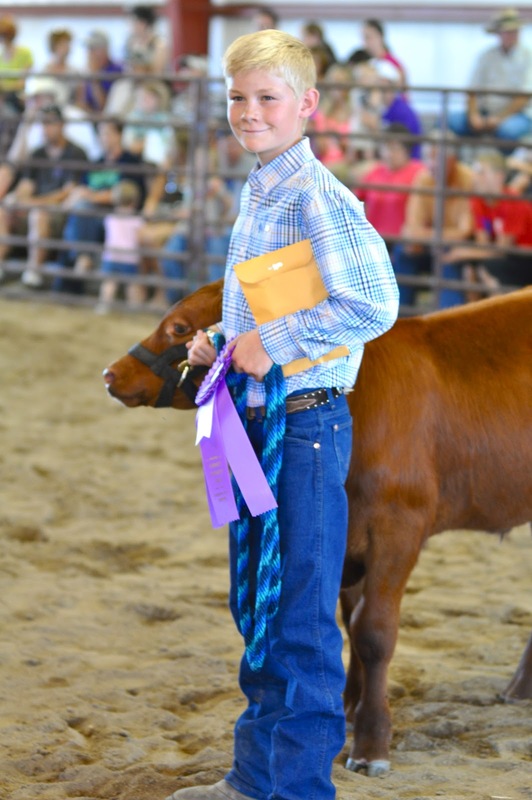 All of the boys received blue ribbons for the judges interview and Benedict earned Grand Champion for the confirmation category, which is the overall health and development of his calf. Whew! What a big day! 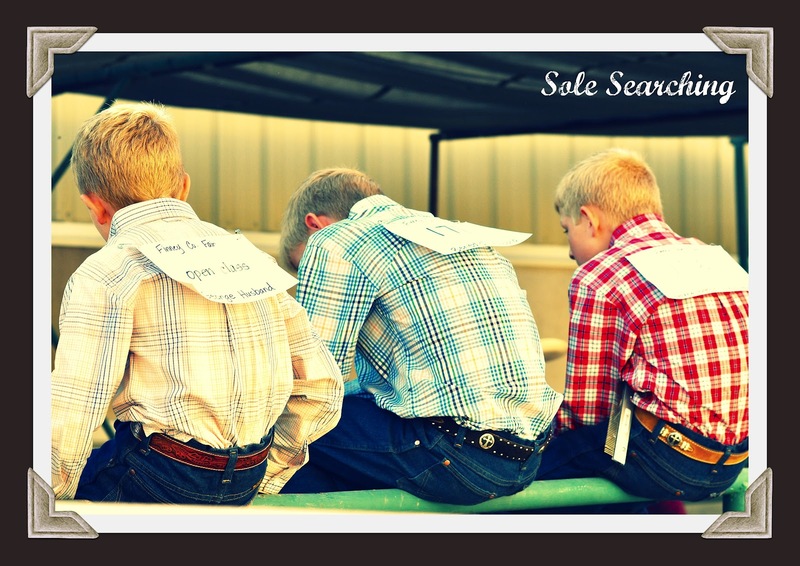 Three little Wrangler bottoms rest on the fence and chat about their experiences. Next year Henry will join them, and soon Charlie. What wonderful memories! 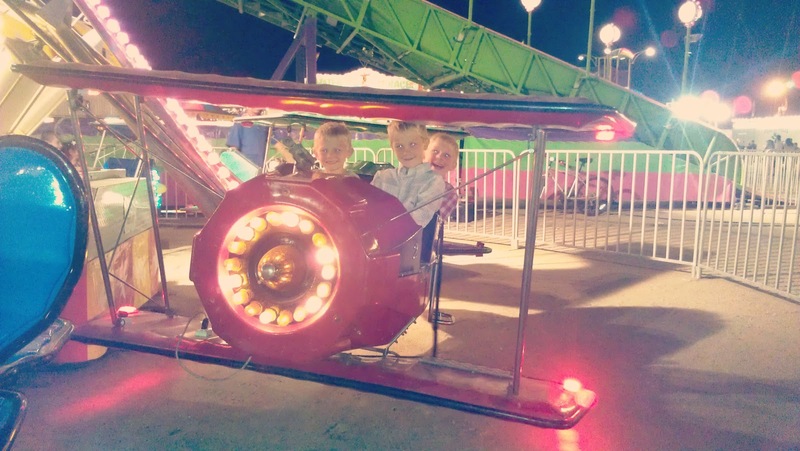 crazy carnival rides and funnel cakes? Your boys are so handsome! You and Steve must be so proud! Thanks, Tammi! We are so proud of them. They are all so very different - different interests, different gifts, all so special and dear to us. I'm sure you know the feeling!! Looks like a great time! Wish we could have made it to watch! We got to show Grandpa's bucket calves at the Scott County Fair this year and the kids loved it! I think we might give the Finney County Fair a shot next year:)! How fun!! We would love to hang out with you guys at the fair next year. I'm not sure if Ben and Andrew will do bucket calves, but George and Henry will for sure! Your post sent memories from my childhood flooding back. From age 8 to 18 I had a 4-H steer. Along with my siblings, I spent summers training, bathing, and brushing our steers. Fair week was always busy, hot and dirty! Those steers did get the spa treatment, with hair cuts, hair spray and clear polish on their hooves! The best part was the time spent with my dad. After his passing, I had a hard time when I went to the fair that summer. The sights, the smells were so strongly associated with him and our time together. Thank you for sharing your thoughts, Lisa, it really means a lot. Making memories with our family really is what it's all about, and I am sure that your father felt the same way! I tell you, there is nothing better than a county fair. I grew up showing---first show was 19 years ago--and I just cannot explain to people how wonderful that experience was and how much I learned from it. I'm so grateful for all of those experiences, memories and lessons! Nice to "meet" you Susan!! 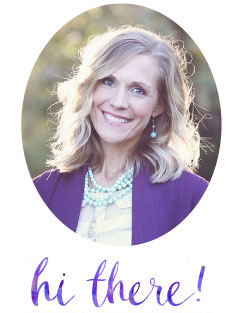 Oh, my gosh, your kiddos are beautiful! 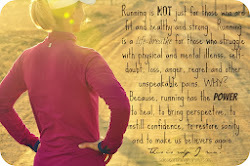 Love your blog, makes me want to run too! I MISS the county fair so much!! 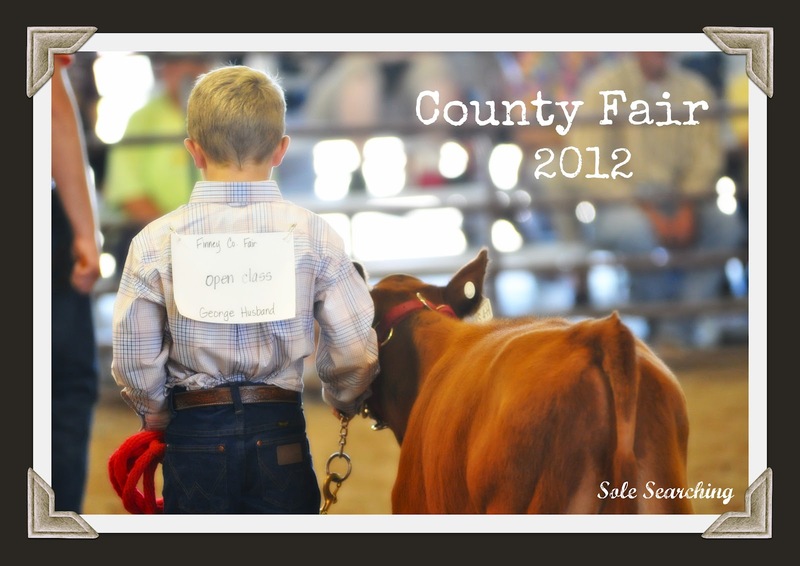 I grew up in 4-H and remember spending all day, every day at the fair. You are making me miss living in the country! !